Amid a flurry of activity in the two days leading up to the NBA's trade deadline, the Milwaukee Bucks emerged as one of the clear winners after the dust settled. 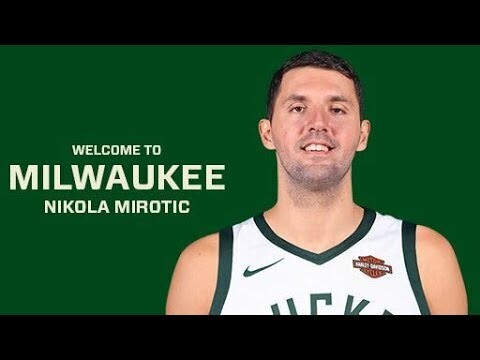 Milwaukee acquired Nikola Mirotic from the New Orleans Pelicans on Thursday, hours before the trade deadline, and gave up bench players Thon Maker, Jason Smith, and four second-round draft picks to bring in the talented big man. Mirotic, who is averaging over 20 points and 10 rebounds per 36 minutes, also shoots nine three-point shots per 36 minutes and hits at a 38% clip. That long-range ability should serve him well in Milwaukee. The relatively low cost to acquire Mirotic stunned basketball observers, as Milwaukee acquired Mirotic for essentially spare parts. Thon Maker, a first-round draft pick by the Bucks, requested out of Milwaukee last month to seek more playing time. Maker will head to Detroit, and the Pistons will send New Orleans 22-year-old wing Stanley Johnson. Jason Smith was a contract match piece acquired from Washington back in December in the Matthew Dellavedova-John Henson salary dump, and played only 40 minutes across six contests in a Bucks uniform. Here are some of the accolades awarded to the Bucks for the Mirotic deal. ESPN's Brian Windhorst called the trade a ' grand slam deal ' on The Jump. ESPN.com gave the Bucks high marks , and ESPN's Zach Lowe wrote that the Eastern Conference's top teams face a major crossroads this year, including the Bucks , who now have four starters on expiring deals. The Ringer listed the Bucks as a winner , noting that the trade does offer yet another roster management problem for the offseason, but that can wait until after the NBA Finals. CBS Sports placed the Bucks' trade for Mirotic as the fourth-most important deal in the past week or so, but that the addition could be the key to a deeper playoff push. Bleacher Report gave the Bucks an A- , noting that the Bucks did give up several assets to acquire Mirotic on an expiring deal. But, Milwaukee is all-in for this season. We'll have reaction on every program on 97.3 The Game in Milwaukee and The Big 1070 in Madison. We got a breakdown of what to expect from Nikola Mirotic on Thursday's Mike Heller Show.